Is stepping into your shower enclosure like walking into a Haunted House on Halloween? You’re unsure what’s lurking (and growing) inside of this small spooky space. What’s worse is you have to go into this horrific tiny dark box on a daily basis – OUCH! In many cases your shower has been doomed from the start. The original homebuilder put in a cheap fiberglass one-piece unit which is yellowing, cracking and has scum you can’t even bring in a magician to clean off. Possibly you bought your home from an “expert” DIY’er (or so they thought) who created a tiled shower you swear your 5-year-old could have built better (some homeowners just don’t know what they don’t know). Why continue to put up with this spooky, ugly, high maintenance and maybe not so safe shower anymore? It’s time to no longer have your shower be such a pain in your _________ (fill in the blank). It’s time to take a shower “pain management” class. In this article get 7 practical tips to create a shower stall you’ll actually want to shower and relax in! Flimsy 3/16” thick framed shower doors with a channel at the bottom not only look low-end, but are a hassle to clean (have you ever had the “pleasure” of cleaning out hair and scum from the bottom of this door channel?). These doors certainly won’t earn you any House Beautiful style points either! A simple solution for the framed shower door challenge (if you have the right sized space) would be to go without a door. This eliminates not only the cost– but the hassle of cleaning the door as well. If your shower is not big enough to go doorless (60” of total width at the opening will usually accommodate a walk in doorless shower) the next best option is to use a door which does not have a frame around it. These doors are sleeker and more contemporary. Their only drawback is they are more expensive than the framed door you’ll be replacing (yes better is usually more expensive – bummer!). 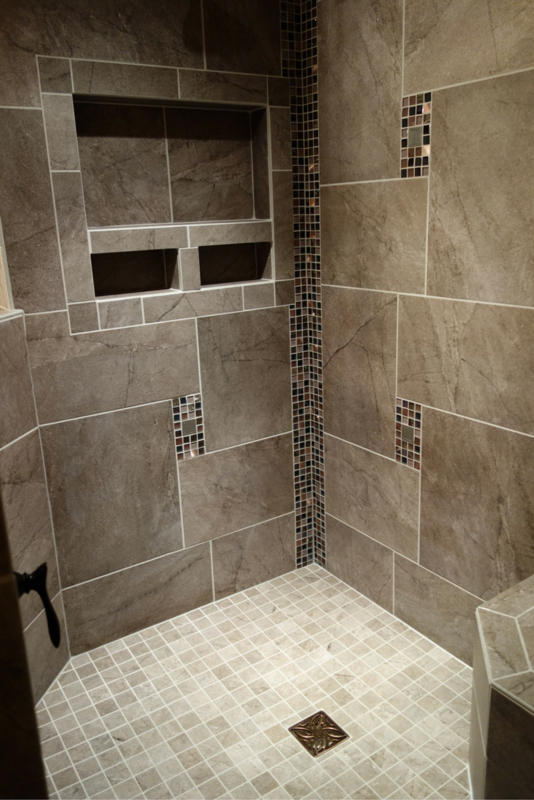 Shower pain management tip #2 – Say bye-bye to grouted walls and floors! People love tile – they hate grout. So why do so many showers still use ceramic tiles and grout today? One reason would be tradition. If this sounds like a “Fiddler on the Roof reason” to use tile, in many cases it is. Most builders have tile setters they regularly use on their homes. Every remodeler or home builder knows how to get a tile job done. The only problem with this is, the guys installing YOUR tile aren’t coming in to clean for you (and if they were in charge of cleaning I’d bet there would be a LOT less tile jobs done today). The solution is to go grout-less and use grout free shower wall panels. The knock on the “big box” shower wall panels people know about is they are cheap and flimsy. 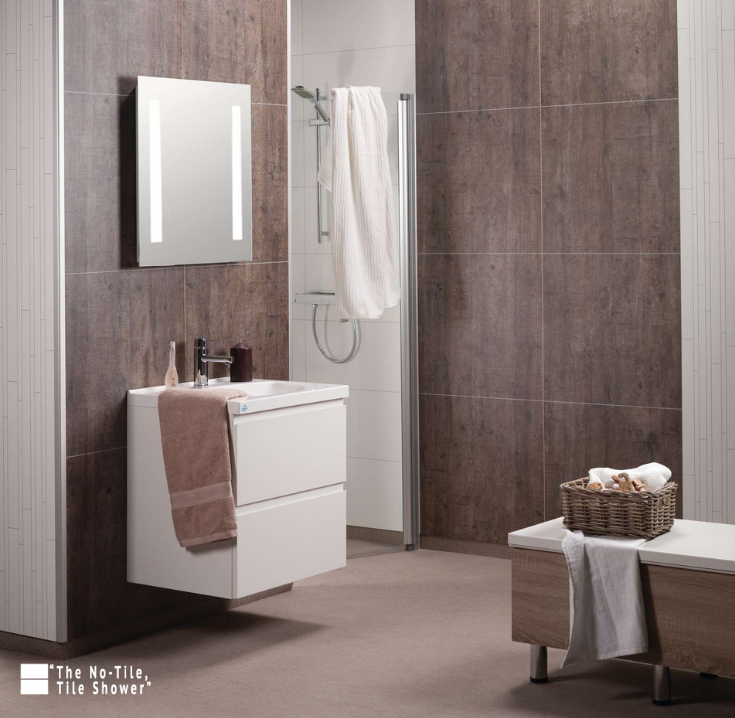 While this can be the case – there are much better systems available today like cultured marble shower wall panels, sleek contemporary high gloss panels or even laminated shower walls (which are known as ‘The No Tile, Tile Shower.’). Cultured marble wall and tub front panels in a contemporary home. If you think these will be cheaper (in initial purchase price than tile) I’ll unfortunately tell you probably not. However, if you factor in long-term maintenance costs and time you’ll get sucked into cleaning tile, the wall panels are an excellent alternative. What many people don’t realize is you can also get grout free shower pans (in any size or shape) to get rid of the grout for the shower floor as well – without having to use some cheap fiberglass system. Shower pain management tip #3 – Showering products everywhere – but where’s the storage place to put them? Do you have shampoo bottles on your shower floor? Worse yet do you own one of those ugly plastic shower caddies which looks like it was a (not so glorious) “find” at the dollar store? Some showers (like the closets in our homes) were not designed to work with the way our families live today. In my master shower – we’ve got products…and then we’ve got more products (creams, lotions, shampoos and shaving products are everywhere). The best way to have storage without taking up any space is to use the inside wall cavity and create recessed niches. 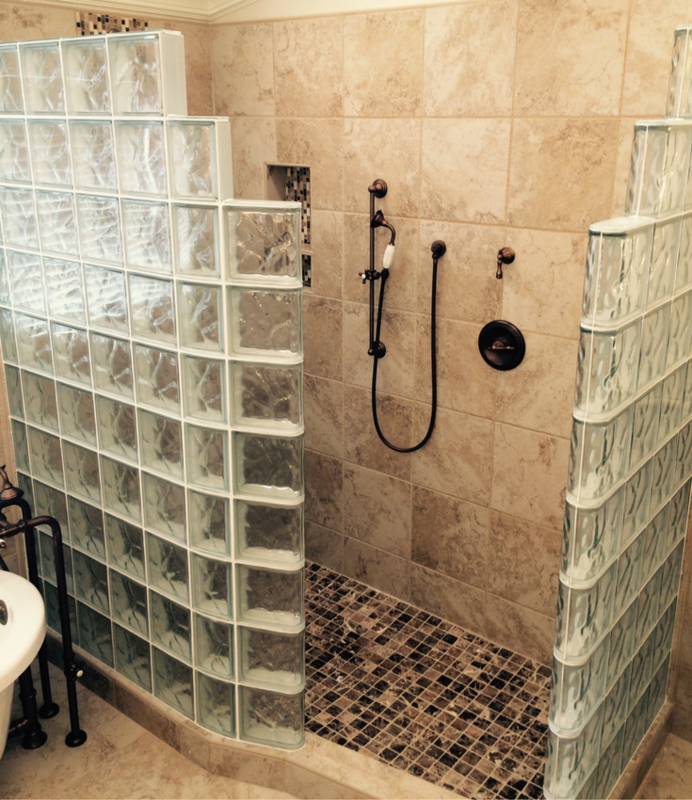 This will make your shower more spacious and safer (since there are no slippery products on the floor). The only caution I would give with this is to not put the niche on an outside wall which you can’t insulate (or if you’re in the Northern states you could have “frozen” shampoo in the winter! Or maybe you can make frozen daiquiris in the shower! Probably not – but a funny thought). Shower pain management tip #4 – Don’t let your shower trip you up! Showers can be dangerous places to enter. Stepping over a 4 to 5” high shower curb which is a breeze for your 16-year-old nephew or grandson can be a big burden if you’re not as nimble as the old days. 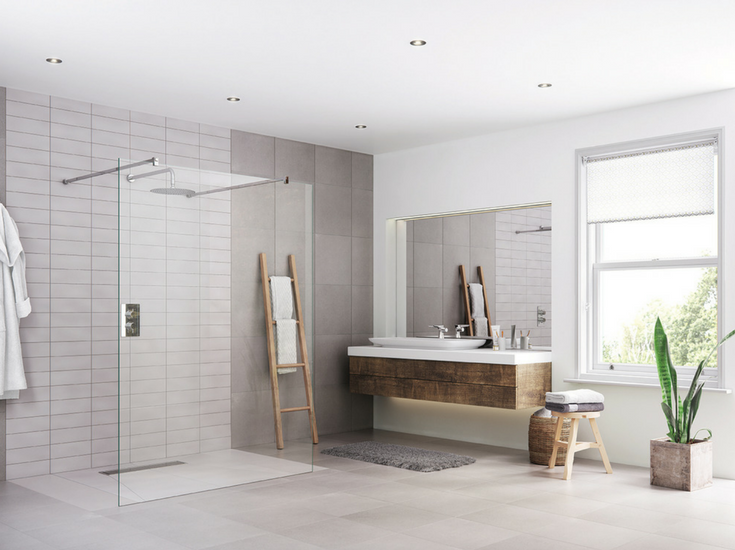 What’s nice today is you can have a sleek contemporary shower which is safe for everyone in the family irrespective of their level of mobility. You can make this a reality with a barrier free shower pan. There are systems which don’t require your contractor to “drop the floor” and cut your joists down. With one level wet room systems you can get a waterproof bathroom which is curb free and easy to get in. 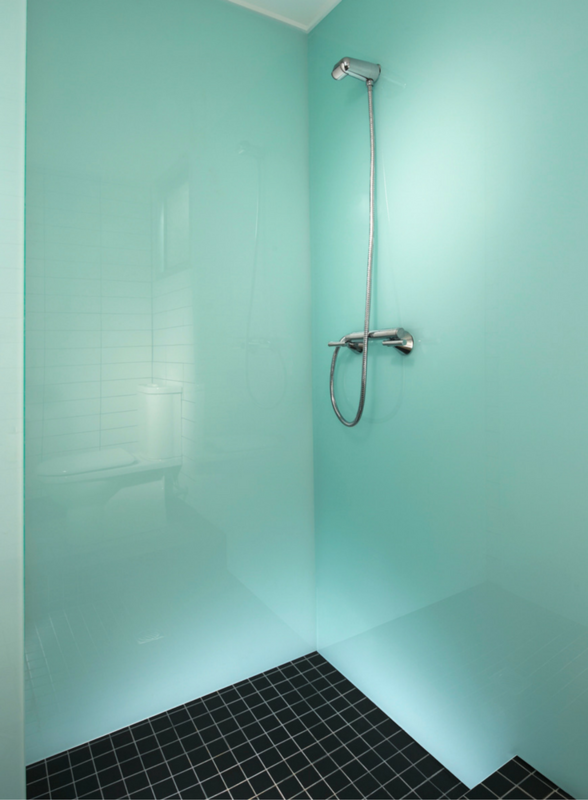 If you don’t want a tile shower you can also use a low profile acrylic shower pan. They are simple to install – and are now available with ‘no-sag’ floor pans which are sturdy all the time. This is a low profile contemporary acrylic shower pan with a concealed drain. It’s stylish, yet more cost-effective than stone. How fun is it having the “pleasure” of getting blasted with cold water when you turn the shower on? Now that will make a man out of you (even if you’re a woman!). In many showers it’s possible to use the design of the shower to get rid of this problem. Instead of putting the shower controls directly under the shower head – put the controls on the entry wall. By doing this you can turn the water on without being under the shower head. Let the water get warm and then get in. Now that’s a novel idea! Shower pain management tip #6 – Are you entering a “dungeon” or a shower? It’s time to light it up! Add natural light with a window or a skylight. By using a high privacy window (one possibility is a glass block window) you can pull light from the outside and eliminate the chance of neighbors peaking in. A skylight can be another way to “open up” the shower space and give your bathroom a nicer feeling. 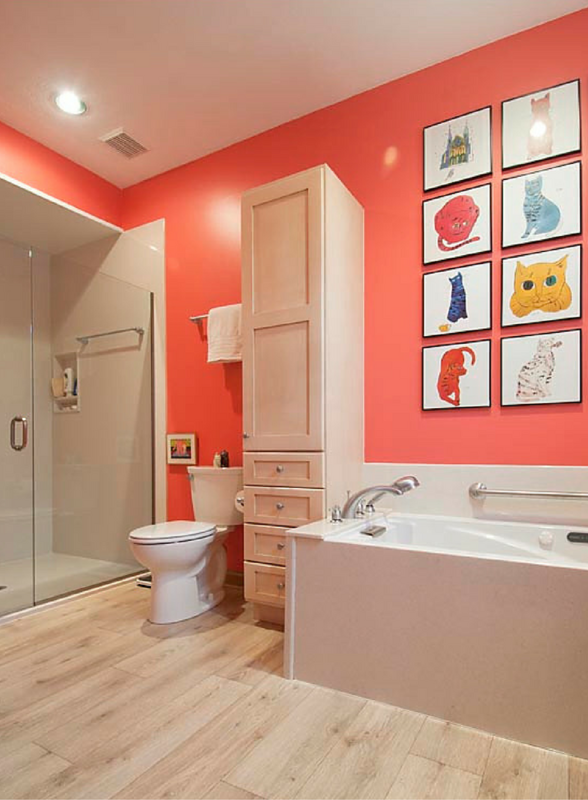 Get rid of any solid interior shower walls – If one of your interior walls is framed it will block light. Take the wall down and install glass. Add a light inside the shower – There are some cool LED lighting techniques possible in a shower – or just add a basic light. Shower pain management tip #7 – I’ve got no place to shave my legs! Most showers are built and designed by men – and most men aren’t shaving their legs! That’s where the problem starts. This is an easy challenge to fix with a knowledgeable bathroom remodeling contractor. If you’ve got a bigger shower put in a shower bench seat. If you’re shower isn’t large (and most aren’t) either add a fold down seat or a shaving “stand” to prop your foot up. Better planning will make it easier for women to shave their legs and shower (and for men if they are so inclined!). Showers today don’t need to be the haunting experiences of yesterday – dark, dingy, mold-infested places you enter at your own risk. 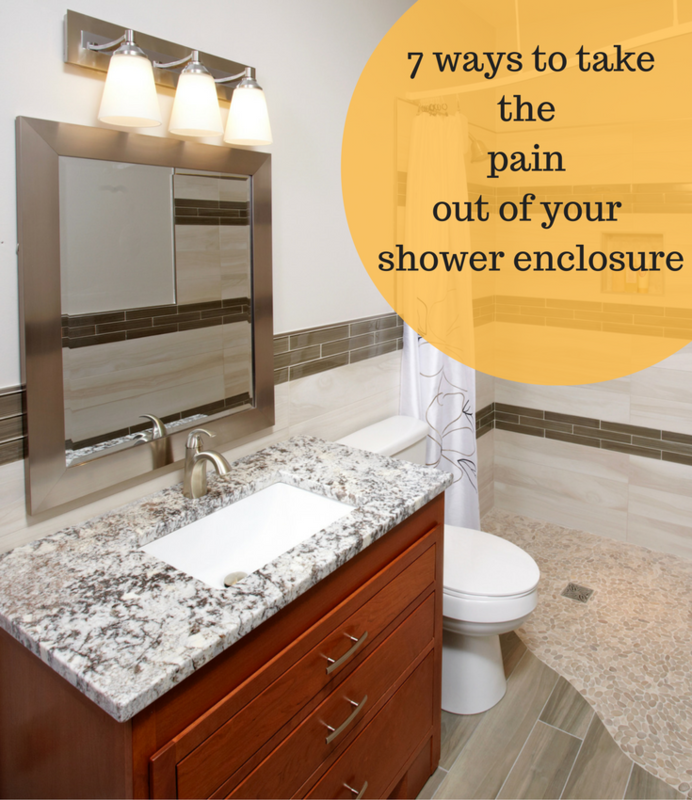 Simply get started on these 7 “shower pain management” ideas and you’ll be on your way to a nicer shower. 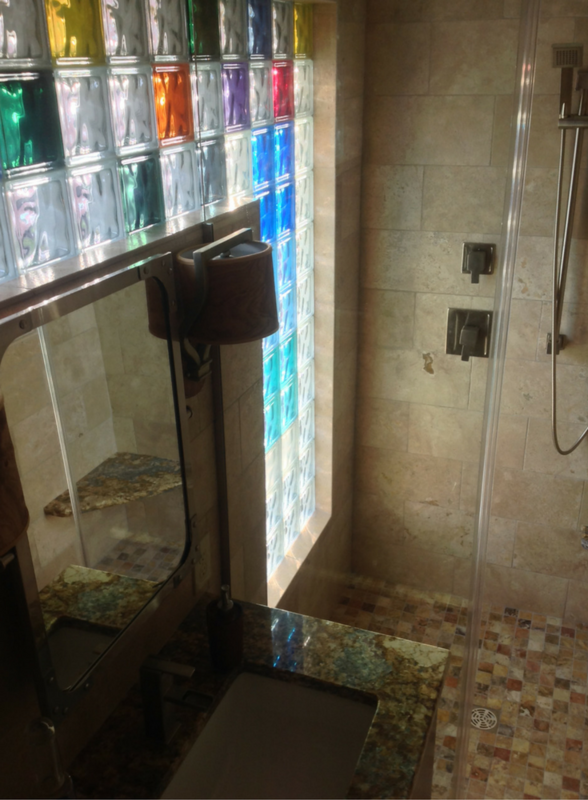 If you need help with a shower design or products give us a call. We’d be honored to help! 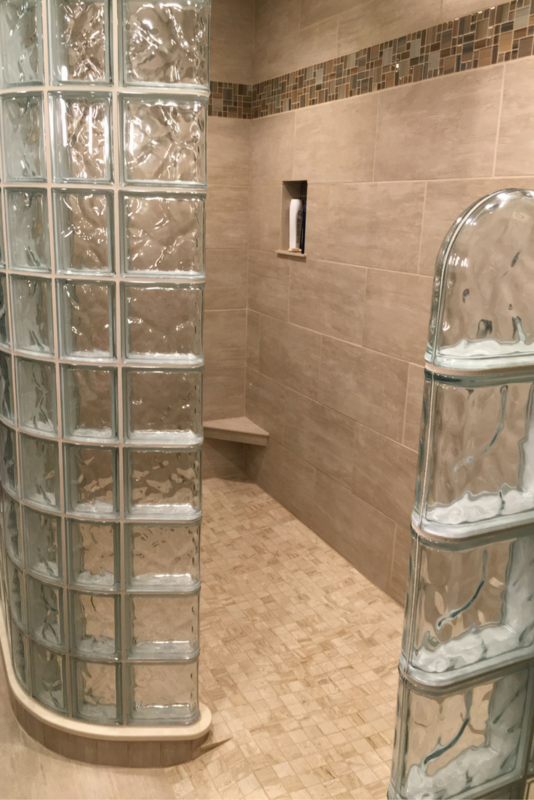 For an Akron or Cleveland shower remodeling project call Cleveland Design and Remodeling at 216-658-1270 or in Columbus the Bath Doctor at (614-252-7294). For nationwide supply of grout free shower wall panels, shower bases, glass block bathroom windows and barrier free shower pans contact Innovate Building Solutions (877-668-5888).